This “Made in Karnataka” speciality is a favourite side dish for pongal, rotis, dosas and hot rice. Gojju can be of different varieties, variation created either by using different ingredients for making the spice powder itself or by using a host of different vegetables and fruits. Generally, just a single vegetable or fruit is used. There are a few rare recipes however where gojju has a mix of vegetables too. This recipe however is created without using any vegetable or fruit. The 3 salient tastes of Gojju are sweet, sour and spicy. In this recipe, they are derived by using jaggery, tamarind and a combination of rasam powder with few other spices respectively. Easy n tasty gojju for you to try n taste! Dry roast urad dhal, methi seeds and jeera. Let it cool and then powder it. Add little water to this powder, make it to a thin paste and keep aside. To this juice, add salt, rasam powder and jaggery. Heat 1 tbsp of oil in a kadai. Put asafoetida and mustard seeds for seasoning. To this add tamarind juice mix. Let it boil for a few minutes. 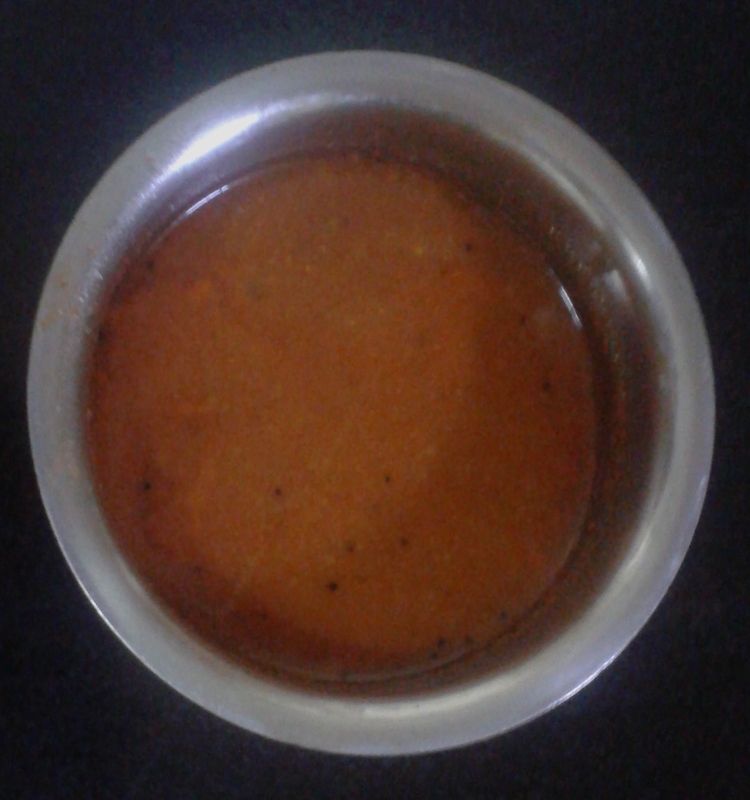 Add urad dhal paste to the boiling tamarind juice. Mix well and continue boiling till you get a uniform slightly thick and even consistency. Tamraind Gojju is now ready. Also view other Gojju recipes at Sarapaaka “Lime Juice Gojju” “Onion Tomato Gojju” “Raisins Gojju” “Cucumber Onion Hasi Gojju”. Tamarind, the most sought after ingredient in Indian households, is most commonly used in rasams, curries, chutneys, gojjus, hot and sour soups, lentil, vegetable and chaat preparations, etc. Tamarind juice (i.e., the juice extracted from tamarind pulp) combined with jaggery or sugar, honey, dates, cardamom, clove and coriander seeds makes for a healthy and refreshing drink. Or tamarind juice with jaggery or honey, jeera and pepper (in fresh powdered form) and a pinch of salt. This juice is believed to be extremely good for controlling skin itching and irritation and can easily be a part of haircare and skincare regimen.